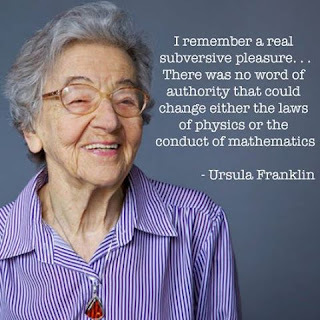 Ursula Franklin was a Holocaust survivor who went on to become a renowned physicist and women’s advocate. 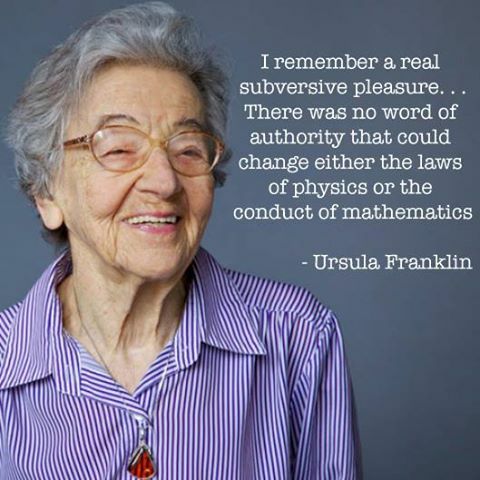 Born in Germany in 1921 to a Jewish mother, Ursula Franklin was forced by the Nazis to discontinue her chemistry and physics studies at Berlin University during WWII. She was shipped off to a forced labor camp, while her parents were sent to concentration camps. Thankfully, all three survived and were reunited after the war, and Ursula was able to complete an experimental physics PhD program at the Technical University of Berlin. Ursula soon moved to Canada, where she became a professor at the University of Toronto and was first female professor to receive the school’s highest honor. She helped develop the field of archaeometry, in which materials science techniques are used to analyze archeological artifacts. She also used similar techniques to investigate levels of radioactivity in children’s teeth, leading to restrictions on nuclear weapons testing. Outside of her scientific accomplishments, Ursula was known for her work as a pacifist and feminist. She was an active member of the social advocacy group Voice of Women (VOW) (now the Canadian Voice of Women for Peace) and she and her colleagues successfully sued the University of Toronto for paying women faculty less than their male colleagues. 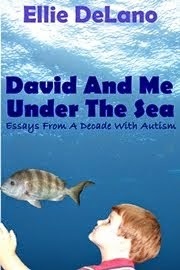 Ursula lived a rich life, with diverse interests, but science always held a special place in her heart. She passed away last July, and her loss has been deeply felt.